During the Cold War, the CIA hired a master magician to teach them deceptive maneuvers. Here are a handful of tricks, recovered from a super secret manual the government thought it had destroyed over 30 years ago. Our spooky spy friends Bob Wallace and Keith Melton—the guys behind the amazing spy-gadget bible Spycraft— uncovered one of the supposedly incinerated "magic" journals. 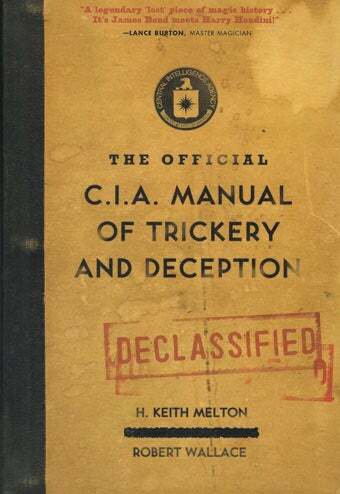 Their new book, The Official CIA Manual of Trickery and Deception, is in part a verbatim reproduction of that manual, but, thrillingly, it also shares the (declassified) history of CIA trickery from the beginning, including the formation of the double top-secret and sometimes sinister MKULTRA division. MKULTRA was supposed to have been erased from history in 1973, but—in true spy fashion—the few shreds of paperwork that remained ended up telling its whole story. The discovered manual was penned by John Mulholland, the David Copperfield and/or Blaine of his day. Though Mulholland knew more than anybody since Houdini about pulling fast ones, his challenge was to teach people who were not necessarily pros to pull off tricks in front of an audience that didn't know it was an audience. Perform a lousy trick, and you don't get booed—you get beheaded. Thanks to Bob Wallace and Keith Melton for sharing their book's illustrations with us. If you'd like to know more about the book, check out its sales page on Amazon (there's a Kindle version too), or visit the authors' new website, CIA Magic.